Once an Indian woman begins to discard English, turns down marriage and motherhood and then voluntarily accesses and fraternizes with vernacular-speaking people not of her own class, she becomes anathema as well as an irritant. It is well known that journalists working in small town India, writing in regional languages, often see the most brutal aspects of the State, which is often hand-in-glove with criminals patronized by powerful politicians. Fact is, journalists writing for big media publications in metros seldom see that home truth. Gauri Lankesh, initially working for a Calcutta-based English weekly in Delhi, took to writing almost exclusively in her mother tongue Kannada, after she returned home to Bangalore and inherited Lankesh Patrige, a Kannada weekly, from her charismatic father and highly respected journalist, Lankesh. Those who knew her say she took the job voluntarily because she knew that in the handling of a language weekly with a rock solid reputation for defying power in the pursuit of truth, she would see different things, meet different people. Being the owner publisher, she could travel when the need arose, to areas where the story was breaking, and tap the necessary sources. Based on the truth she met face to face, often under dangerous circumstances, she wrote her column, ‘Kanda Hagey’, As I see It. Her last column was about Fake News and the vast propaganda machine of the ruling Party that churned out lies and then seeded both the mainstream media and the social media with it. She did this because as a restless journalist, like the one in Andrezej Wajda’s film ‘Rough Treatment’, she found the stories about a Party mercilessly murdering truth compelling, not necessarily because she was waging a political war against individuals (though she did call the great Party leader ‘Boosi Basiya’, someone who opened his mouth only to utter an untruth). Karnataka is a state that has had a strong regional personality : sometimes sad , some times impenetrable but always engaging. It is a dynamic and aggressive state with a faith in science and an analogous faith in history, scientifically analysed and recorded. And it was in recording her times that Gauri found her real voice in Kannada and moved away effortlessly from English, retaining, unlike many other journalists writing in Indian languages, a certain confidence and self respect her middle class upbringing and education gave her. This is when friction began. Once an Indian woman begins to discard English, turns down marriage and motherhood and then voluntarily accesses and fraternizes with vernacular-speaking people not of her own class, she becomes anathema as well as an irritant to both her family and a retrograde political ideology that takes man as the measure of all things. Here was a woman writing in a vernacular, who would not be put down. Who stood up and defied what George Steiner described as the “muse of censorship” again and again and knew powerful people throughout the state. It was a tragedy waiting to happen in a country where so much of journalistic imagination and loyalties have come to be dominated by the State — either in obeisance to its policies or in aggressive resistance. 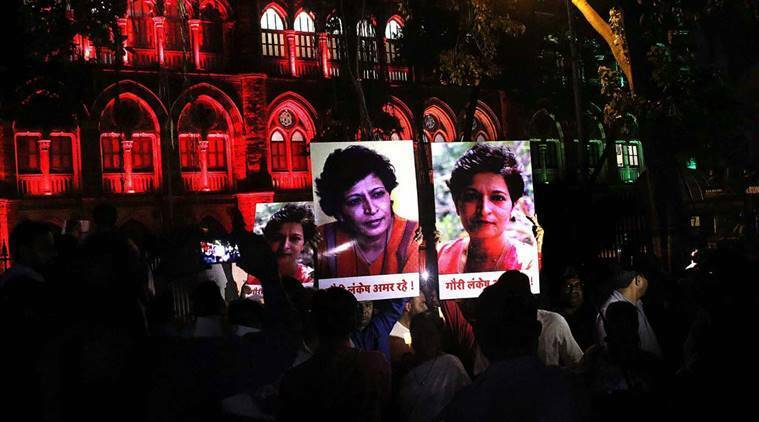 READ | What was the defamation case against slain journalist Gauri Lankesh? 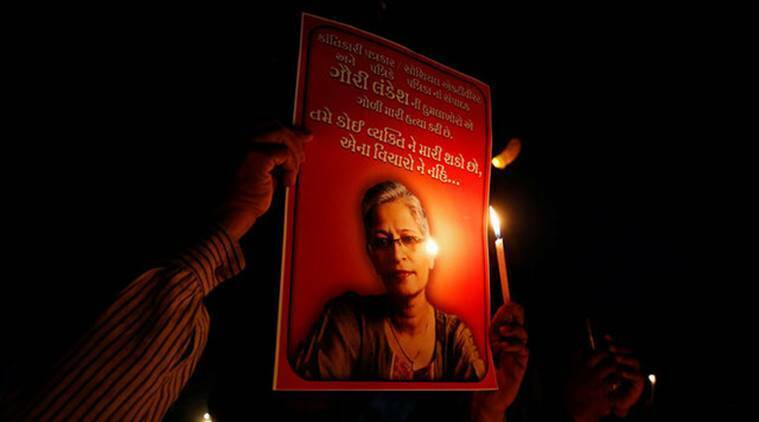 On Teachers’ Day, September 5, Gauri was shot dead by assailants unknown so far, but widely suspected to belong to ultra right-wing groups whose lies and thuggery she had long been criticizing and highlighting with undeniable proof. In her death Gauri has become a part of the story about the State oppressing whistle-blowers and honest journalists probing corruption, stories that she had been working on for so long. Her tragic death even as it is being mourned, gives her column ‘Kanda Hagey’ its coherence: it makes us realize what happens when the forces close in upon an investigative journalist walking alone and in a dark alley, and drown out the questioning once and for all. But anyone who saw the spontaneous solidarity the media expressed against the murder of this seasoned and battle-scarred journalist, realized that journalism is more than a vocation. It is a mission. One would not subject oneself to the dangers if one didn’t feel there was something of overwhelming importance about history, about ourselves, that one was compelled to share with one’s readers or viewers. The wheels of justice will churn, or be shown to be churning, no doubt, especially as the CBI has already confessed (in 2015) to the Supreme Court that it is simply overwhelmed with case work, while 16% of its Bureau posts lie vacant. It is probing some 1200 cases while 9000 others are pending . And more than half its cases, registered between March 2007 and 2016, deal with assaults against journalists who have been probing charges of political corruption. Almost every year in the world’s largest democracy, new leaders pop up, naïve and mystical. A liberation struggle of sorts has pushed them to the top: they are leaders by virtue of the longings of an electorate which needs a Great Name. The leader then constantly feeds and enchants the young , building visions of all sorts of colourful dreams about the great life that is being created for them. The trolls, the spin doctors, the publicity-makers have never had it so good. That’s when Gauri strides in and things begin to dim and lose their sparkle. It’s not our fault we are just beginning to hear. Ask the Congress chief minister who can’t control the goons attacking our mothers and sisters. The perpetrators must be caught and given the harshest punishments. And the media minders move on.